Outdoor Lighting Blog: Wednesday Walk Through: Copper Day! Wednesday Walk Through: Copper Day! Hello and thanks for joining me on my weekly Wednesday walk through the Lanternland factory! Today is COPPER DAY!! 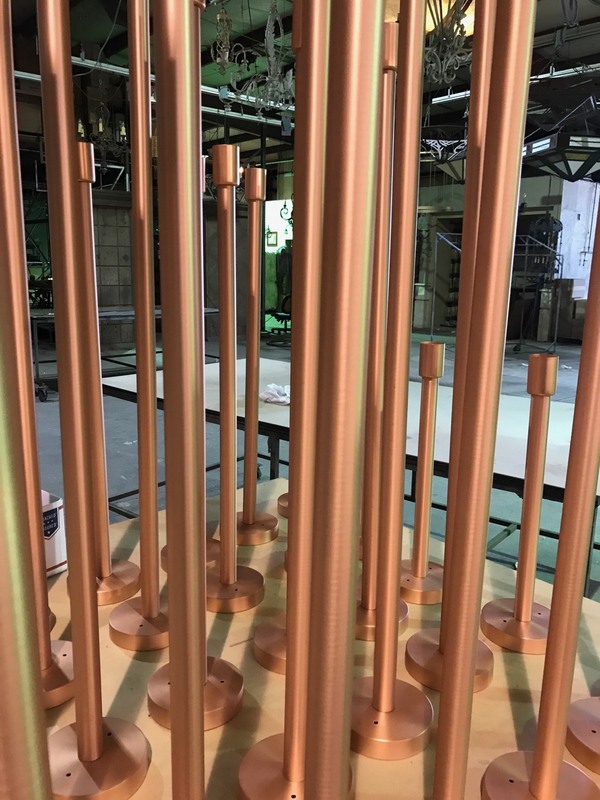 We will see some custom wall mount copper lanterns as they are being made as well as some polished copper parts for a custom linear copper pendant. 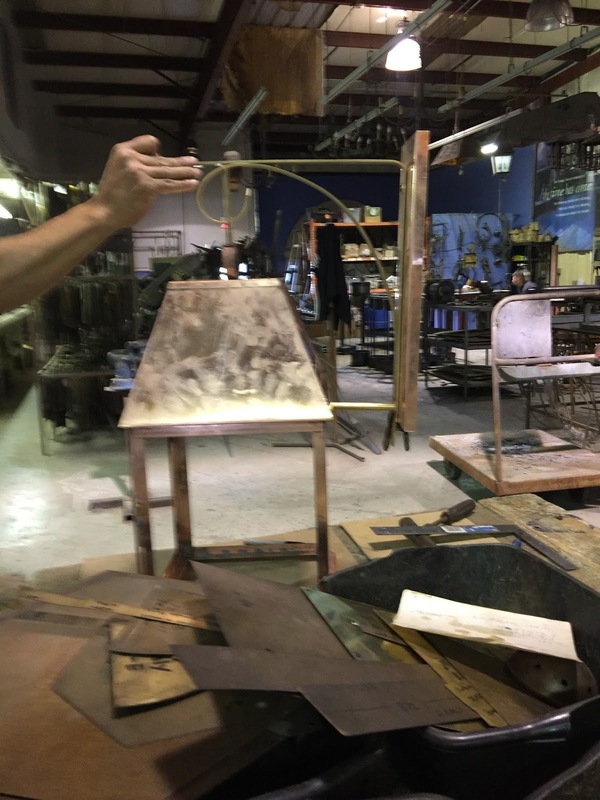 Today we are creating custom copper lantern wall lights for a residence in Vermont. Randy checks the dimensions of the prototype against the specified dimensions on the original drawing. The size of each lantern is checked to ensure a proper fit. This is the shop drawing of the lantern he is making. Here you can see that the backplate has been added. Next Randy checks to see that all the parts are properly "squared up." This ensures that the lantern will hang properly. The backplate has been added; Randy makes sure lantern is properly "squared up". Meanwhile, Eva solders a smaller version of the same custom lantern.The finish will be either Raw Copper, Dark Copper, Antique Copper or Flamed Copper. Personally, for this home, I like the Antique Copper finish to compliment the brick. Which finish would you choose for this design? Mike is also working with Copper today. These polished copper parts will become linear copper pendants. I just want to take a moment before we wrap up to wish everyone a very Merry Christmas and a Happy New Year! At Lanternland we are grateful for our family, friends, and especially all of our talented artisans who work so hard year-round to make every Lanternland lighting fixture by hand. Most of all we are grateful for all of our customers who helped make this a great year for the entire Lanternland family. We look forward to working with customers new and old to make 2018 another great year. Thank you! Thanks for joining me today! I hope you enjoyed it as much as I did. Until next time stay well and remember.. Your Best Source for Handmade Copper Lanterns & Outdoor Lighting Made in USA is LanternLand.com!! On Wednesdays Lanternland founder Ronna Nitzky takes a walk through the factory to see the handmade copper lanterns and outdoor lighting designs being made that day. "I like to walk through the factory, speak to artisans and see what they are making. I always learn something new each time and get exciting new ideas to share with our customers. ", says Ronna. Join her as she takes her weekly walk through the factory and shows off some of the latest copper and brass lighting designs from Lanternland.